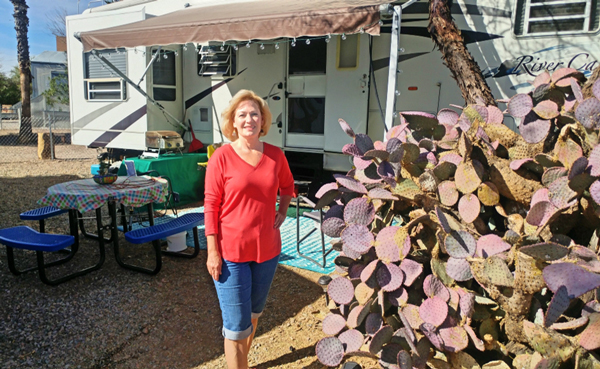 It’s been awhile since we’ve peeked into the lives of RVing writers, so it’s great to introduce another fellow traveler and scribbler. Deb Sanders writes a variety of books — mystery, romance, fantasy, paranormal thrillers…! And she’s prolific, having penned at least eight books to date. How does she manage this while on the road? Let’s find out from the author herself. Which came first — the RV or the writing? Writing came first. Many authors say they started in childhood and I’m no different. My dream was to write for Harlequin. When I was twenty, I penned a romance and sent it off. It came back with a handwritten note from an editor who asked that I make a few revisions and resubmit to her attention. Unfortunately, I was married to an abusive man who convinced me it was a rejection and I would never be a writer. I burned that manuscript and all my notes, synopsis and research for future manuscripts. Thirty-five years later, children are grown, married to an incredibly wonderful and supportive man, and I started again. 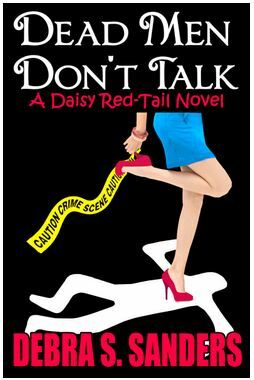 I released my first romantic suspense on Amazon and it became a best-seller. When did you start full-time RVing? Why did you decide on this lifestyle? My husband and I went cold turkey as full-timers three years ago. We sold everything, bought a vintage 24′ pull behind and hit the road with our 90-pound Golden Retriever and cat. We now own a 35′ fifth wheel with three slides. I grew up on road trips and tent camping in the Colorado Rockies. My dad had the “wanderlust” which I inherited. After relocating several times in my career, I learned material things are nice but they can get broken or lost. Memories last forever. How often do you move? In other words, do you tend to spend several weeks or months in one spot before moving on, or do you move every few days or weeks? We spend winters in Arizona. I used to live north of Phoenix so this is my favorite state, and now it is my husband’s favorite, as well. We move quite a bit during the summer because that’s our “sight-seeing” time. Typically, we’ll find a place where we can stay at least two weeks and explore the area on day trips. As holders of the “Senior Pass,” we can stay in Corps of Engineer campgrounds and national parks for half price. That makes it very affordable! We love our Senior Pass, too! With so much to explore, how do you balance the adventure of RVing with the required discipline of writing? Not well!!! LOL I love to hike and explore. Those experiences usually wind up on my blog and/or in my book, *Road Tales – Myth, Lore and Curiosities from America’s Back Roads. * I’m working on a sequel right now. Actually, my balance lies in the fact I’m a night owl. I write at night and explore during the day. Our fifth wheel has a great entertainment center across the back living area. One third is a desk/work station. It has shelving and storage over the desk which I call my writer’s resource cabinet. However, if the hubmeister is watching television, I take my netbook outside or to the bedroom where it’s a little more quiet. What made you start writing fiction? As a single parent, my children were top priority so writing time was limited. I wrote for newspapers, picked up freelance work, brochures, marketing blurbs, newsletters, etc. But I have a vivid imagination so when it came time to write a novel, suspense and thrillers were the genre I gravitated toward, with a bit of paranormal thrown in from time to time. You’ve written in a variety fiction genres — mystery, romance, fantasy, paranormal, thriller…. Do you set out to write a certain type of book because the idea for it is wrapped up in the genre? Or do you have to sort out the type of book as you go? The story comes first. I don’t worry too much about being genre specific because today’s market supports cross genres, or blends. I can assure you, however, there’s always a bit of suspense or mystery in every book. Do you work on one book at a time, start to finish, or do you have a few projects going on at the same time? I usually have a couple of projects going. When I hit writer’s block on one, I pick up on another. What I don’t . . . or rather, can’t do is write outside of chronological order. Every time I try, I end up with tons of rewrites. My characters evolve with the story and don’t always follow the plot. Currently, I have four projects in the works although one is plotted and not started. Unless I missed it, none of your fiction books uses RVing as an element. Do you have any plans to use RVing as a backdrop or RVers as characters in a future novel? I am working on a psychological thriller right now that includes RVing in the plot. Oh! Can’t wait to read that one — I hope you’ll let us know when it’s available. What have I not asked about that you’d like to mention? I’m an “on-call” Fema contractor who works as a housing and personal property inspector following natural disasters. After three months in Texas and Florida last year, I came back armed with enough research and imagination to write a second psychological thriller. VERY excited about this one! I think it’s important to stay connected to the writing industry while on the road. I currently am a member of Sisters In Crime and also the Desert Sleuths chapter in Phoenix. I belong to Arizona Mystery Writers and participate in the outstanding event Tucson Festival of Books each year. I love commiserating with other RVing authors via Penwheels, Authors on the Road and several Facebook groups. Meeting my readers is important so I try to arrange author events several times a year. Last year I presented Gold, Ghosts and Gravel Roads to a standing room only crowd at Escapades 57. 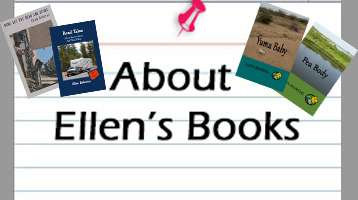 Based on my Road Tales book, the presentation encourages RVers to search out lesser known adventures such as ghost towns, treasure hunting, oddball museums and paranormal activity. I was invited back this year but declined due to a scheduling conflict. That’s pretty exciting! How can others find out where they can be one of the folks standing at your next event? Thank you for the great interview, Ellen. I’ve enjoyed answering your questions and look forward to sharing a campfire and sunset down the road! 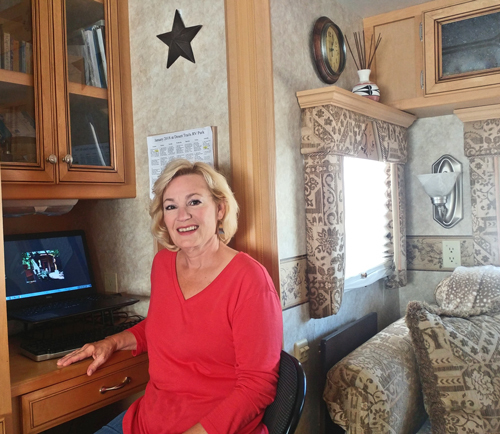 Next Post RVing Novelist Interviews — In One Handy Spot! Great article, Deb. Excited to find your books.Hubby & I travel and I try my best to write as well. Not easy since we love sightseeing. Hope to meet you on the road. Check out my website: janettafudgemessmer.com Happy travels! Thanks, Janetta! I appreciate you stopping by. I’ll be sure to check out your website!